Al-Jazeera says it has been forced to close its English-language bureau in Beijing after its reporter was expelled. China's decision not to renew the press credentials and visa of Melissa Chan is the first such action against a foreign reporter for many years. Officials have also refused to allow a replacement for Ms Chan, al-Jazeera's China correspondent since 2007. China's foreign ministry refused to say why the reporter had been expelled. "We stress that everybody must abide by Chinese laws and regulations and must abide by their professional ethics," spokesman Hong Lei said, responding to repeated questions. Al-Jazeera said it would "continue to request a presence in China". The channel expressed its disappointment in a statement, adding that it had been requesting additional visas for correspondents for ''quite some time''. The move does not affect its Arabic-language service. The move will be viewed as an attempt by the Chinese authorities to intimidate foreign media operating in the country, says the BBC's Martin Patience in Beijing. 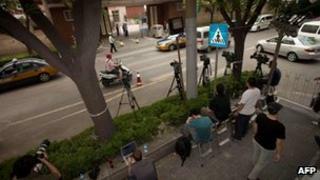 The Foreign Correspondents' Club of China (FCCC) said it was "appalled" by the decision. Beijing insists foreign journalists are free to report in the country apart from Tibetan areas, where restrictions apply. But in reality, correspondents often face harassment and sometimes violence when covering sensitive issues. Just last week more than a dozen journalists were summoned to the Public Security Bureau after they entered Chaoyang Hospital - where the Chinese dissident Chen Guangcheng is receiving medical treatment. All were told that if they broke the rules again their visas would be revoked. Two other reporters had their press cards taken from them, and only returned once they too had received a warning from the police. This expulsion is not directly related to Mr Chen's case or coverage of the downfall of the Chinese politician Bo Xilai. Pressure mounted on al-Jazeera after it aired a documentary last year on China's prison system. But Melissa Chan had no part in the project. Earlier this year, Foreign Correspondents' Club of China issued a warning to its members after journalists were attacked while covering village protests. In one incident, a French reporter had his car rammed and a group of thugs beat up his Chinese assistant. "Chinese officials had expressed anger at a documentary the channel aired last November. Melissa Chan did not even play a part in making that documentary," it said in a statement. "They have also expressed unhappiness with the general editorial content on al-Jazeera English and accused Ms Chan of violating rules and regulations that they have not specified." Her expulsion, the statement added, followed three months of ''uncertainty'' when she was issued short-term press credentials instead of the standard one-year accreditation. Ms Chan, who is a board member of the club, had to leave China when her last one-month accreditation expired and was not renewed. "This is the most extreme example of a recent pattern of using journalist visas in an attempt to censor and intimidate foreign correspondents in China," the FCCC said. It is believed that this is the first expulsion of an accredited journalist since 1998 when Der Spiegel's correspondent Juergen Kremb was expelled for allegedly being in possession of state secrets. Mr Kremb denied the allegations. The al-Jazeera case comes as China prepares for its once-in-a-decade leadership change - a sensitive period in domestic politics. It also follows two very high-profile cases that have focused attention on China. The sacking of former political high-flier and Chongqing party leader Bo Xilai has attracted widespread media coverage. So too has the recent case of activist Chen Guangcheng and his six-day stay in the US embassy after escaping house arrest in Shandong province.